I would totally love to have this cornbread for breakfast!! Yum! Thanks for sharing this easy recipe. Hi Jen! Wish I’d seen this post yesterday. We had red beans and rice with Andouille sausage last night and this would have been perfect with it! Here in the South most people like cornbread made with white corn meal it is not sweet at all. Not me, this sounds perfect! I usually don’t make cornbread until the weather turns cooler and warrants chili, but I just had to try this one! So glad I did! It’s just the right amount of sweet without being too much. So many cornbread recipes are dense and heavy. Not this one! Perfect! You are so welcome Christina! 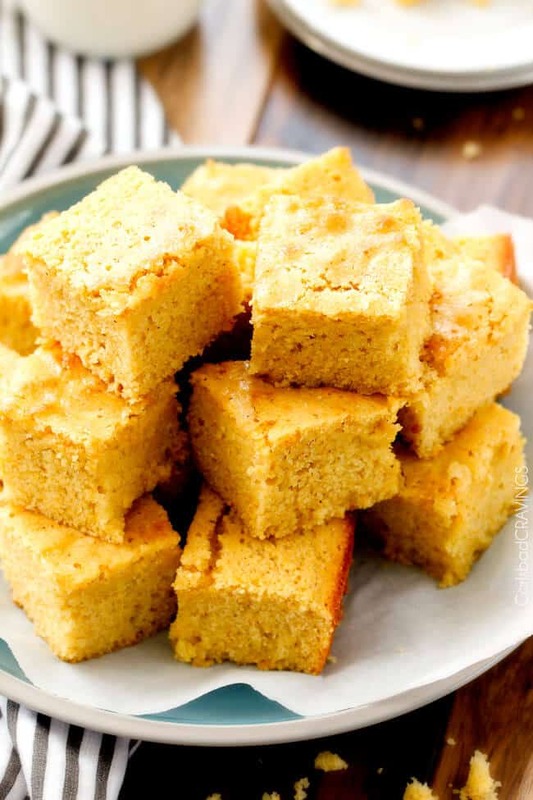 I am so happy you tried this cornbread and loved it because it is one of my favorites! Thank you! I just made this corn bread. It is very moist, a little too sweet for me but aside from the sweetness it is very good. Thanks Ida! Next time if you use less sugar hopefully it will be perfect! I love this corn bread! We’ve made it a couple times now with gluten free flour (so I can enjoy it too! ), and you would never know it was gluten free. It is so delicious. Perfect! 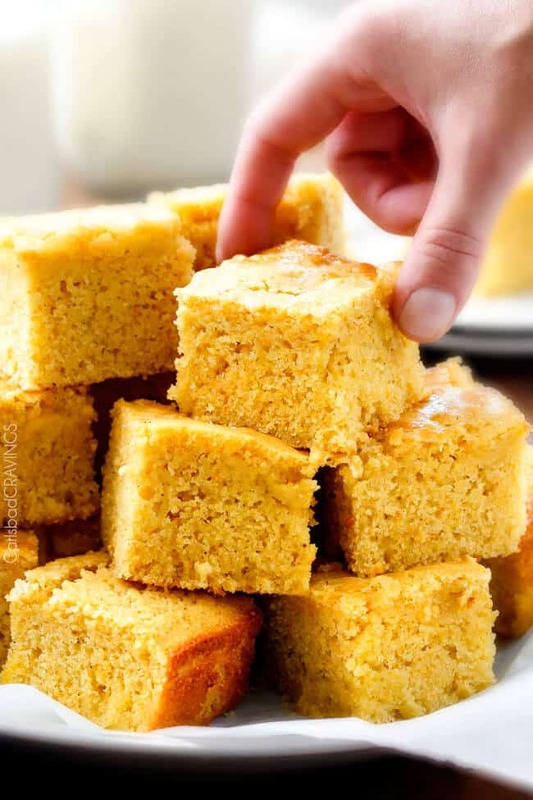 When I was serving my mission in Iowa, there was a cornbread contest at one of our Stake activities and I thought I was in heaven…until I started sampling all the pieces. They were NOT sweet at all, not even one…some even had whole kernels of corn in them. I had to chuckle at my ignorance and expectations that all would be delicious sweet corn bread. I think they are totally missing out. Sweet corn bread is the best. Thanks for sharing this recipe. That is amazing Erin, seriously I have a huge smile on my face – thanks for sharing and a huge congratulations!!! Thank you Suzanne! 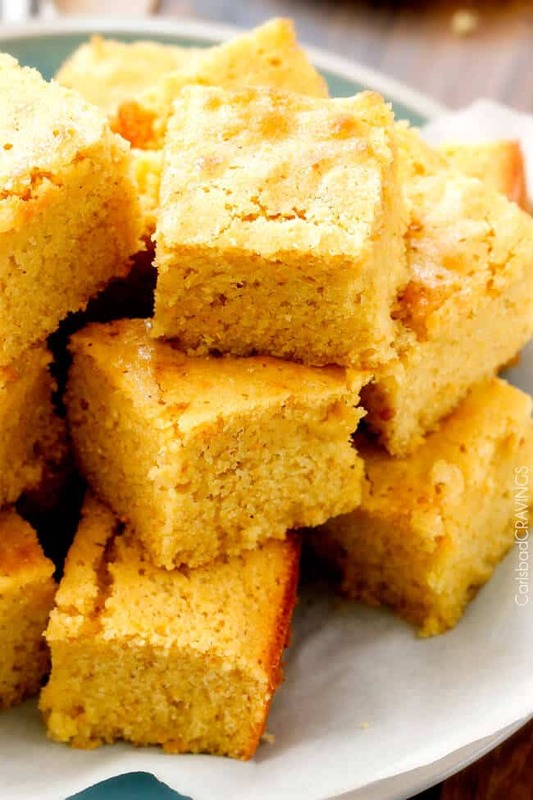 I hope you love this cornbread and everything else you try here! Hi Jen, Can I use regular milk with this recipe? Will it affect the whole recipe? Hi Stacie, instead of regular milk, I would make your own “sour milk” by adding two tablespoons vinegar or lemon juice to a 2 cup measuring cup then filling with milk to equal 2 cups. Let sit 5-10 minutes and that should do the trick! Thanks, Jen, for a great recipe! The best compliment was my one guest, who is a cornbread fiend, had 3 helpings of it and asked to take some home! I used only 1 c of sugar, which was the perfect amount for our palates. The cornbread had a nice texture – dense without being heavy and light without turning into a mess of crumbs. This is now my go-to cornbread recipe. You are so welcome Jen, thank you so much for your comment! I am so happy this lived up to even your “cornbread fiend friend’s” expectations 🙂 and is now your go-to recipe – awesome! Thank you so much! I love this recipe! 9×13 is a little big for just me and my bf though, would the recipe need to be altered to fit an 8×8 brownie pan? Hi Jessica, I’m so happy you love this recipe! An 8×8-inch pan is just slightly bigger than a halved 9×13, so I would half the recipe and reduce the baking time by about 5 minutes. hope this helps! Best cornbread I’ve ever made. Cake like, moist, sweet. I did alter the recipe in that I used only one cup of sugar. Thank you. One other thing, It fill 24 standard muffin tins. Awesome Elizabeth, I am so flattered this was the best cornbread you have ever made! Thank you so much! I’ve been trying different recipes lately and this is the only one my husband (who hates cornbread) likes. Very good, moist without being heavy. That is awesome, thank you! I’m so happy you finally found a cornbread to satisfy the non-cornbread lover! Delicious! 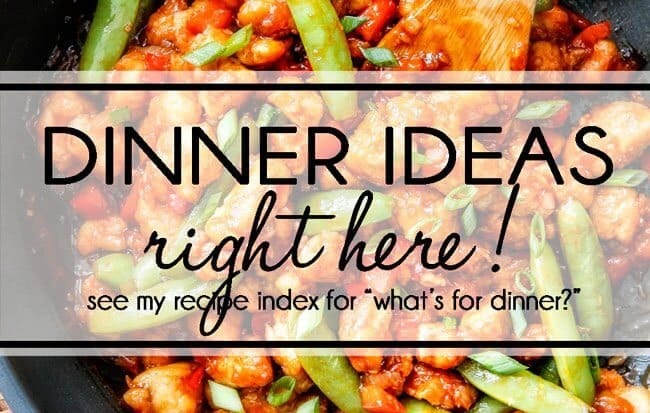 Made this tonight + it’s my new go to! Awesome Annie, I’m so happy you loved it so much, thank you! This sounds so delicious, I can’t wait to try it with our chili tonight! Quick question though, if I’m using self-risingg fne corn meal, do I need the leaveners? Or should I leave them out? Sorry I’m just getting to your comment Jessica! I would leave them out. Hope you loved it! Oh my, finally the perfect cornbread!! I just found this recipe today, and made it this morning to go with a version of your thai butternut sweet potato carrot soup I also found today (also amazing, that will be a separate review). this cornbread is amazing! I have tried many recipes, to find the perfect cornbread but they were either dry, too crumbly or tasteless. Finally, my search is over! I was looking for a similiar cornbread to one sold in a local chain, but this is so much better! And costs pennies to make. I did omit the vanilla, and because I didnt know how this recipe would turn out, I made a small pan by cutting the ingredients in half, and using 1/2 c sugar. Next time, I will make a full pan! I served with honey butter and the thai butternut sweet potato carrot soup..oh yum!! A huge hit in our house! yay!!! I’m so happy your search for the perfect cornbread is over and you love it so much! Bring on the full pan 🙂 I hope you have fun trying more of my recipes! Happy Thanksgiving! Excited to try this! I usually make a cornbread casserole but my husband isn’t a fan of the actual peices of corn in that, and prefers the sweet cake-like cornbread. I plan to make this for Thanksgiving. Can this be made the day before? Or should I just bake it very early in the morning? Hi Melinda, I’m excited for you to try this cornbread and hopefully your husband will love it too! You can certainly make it a day in advance – just be sure to keep sealed in an airtight container or plastic wrap once cooled so it stays nice and moist. Happy Thanksgiving! 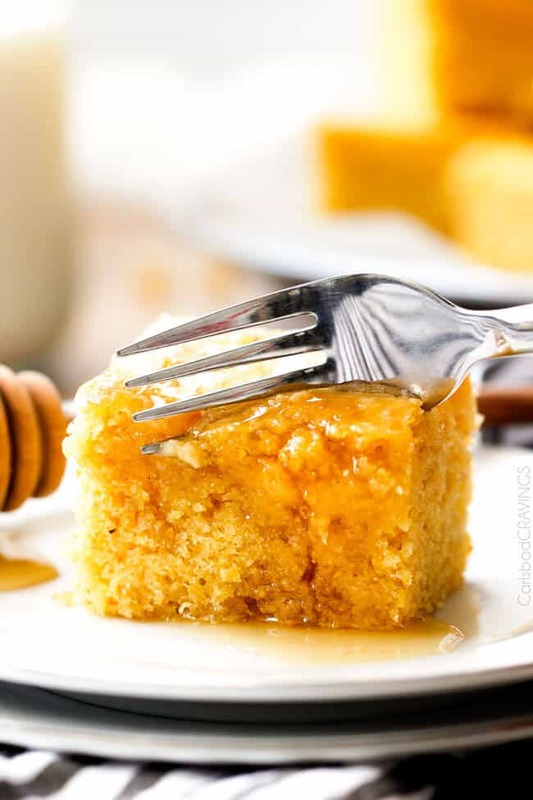 My husband and I are constantly on the lookout for the perfect cornbread recipe – you know the kind that captures those sweet slow Sunday afternoons at Grandma’s house? Well this was definitely 100% it!! We made the full recipe using 1 cup sugar and made our own buttermilk (3/4 c whole milk and 1/4 cup freshly squeezed lemon juice) and the end results were the things childhood dreams are made of! 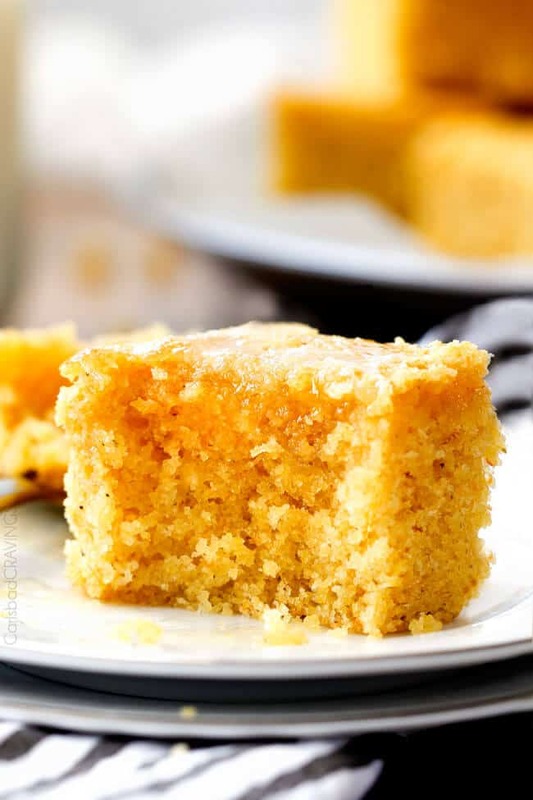 The perfect balance of sweet and moist with the very distinct taste and texture of cornbread from days gone by. We served it with your slow cooker ribs and our picky eaters (ages 8, 3, and 1) all had seconds of the cornbread with their dinners (something they’ve never done with cornbread previously!!) The next morning my husband and I were happy to munch on the leftovers with a drizzle of honey and a big cup of coffee. Delicious!! Currently making 2 more batches to celebrate a friend’s birthday and I’m seriously considering cutting half of one of the pans so hubby and I can have them for dessert later! Thanks for the amazing recipe! YAY!!!! Thank you, thank you for your awesome comment Elissa! I am thrilled your hunt or the perfect cornbread stops here! It sounds absolutely perfect with my ribs and I’m so glad eve the picky eaters enjoyed it! Hi Stacy, I’m so happy you are loving my recipes! This can definitely be made in a cast iron skillet. I haven’t personally done it but after reviewing other recipes it looks like you need a 12″ skillet, bake at 425 degrees F for about 20 minutes or until golden and baked through. Hi! I made your recipe about a year ago and it was a huge hit! My wife has requested cornbread muffins as part of her bbq dinner party. Do you know how well this recipe would translate into muffins? And any idea how long they would need to bake for? Thanks! Hi Nina, I’m so happy you love this cornbread recipe! Yes, it should transfer well to muffins. I haven’t personally baked them as muffins but judging from other cornbread muffin recipes, I would bake at 400 degrees F for 15-20 minutes. Happy Birthday to your wife!